Thermo-Tec Super Sonic Sound Dampening Mats offer superior sound dampening control to reduce road noise, rattles, engine noise, and any other noises and vibrations that are bothersome. 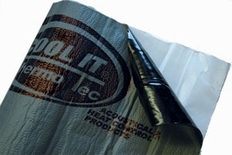 The high density polyethylene film with an aluminum foil composite is abrasion and tear resistant. The gray film provides structural integrity & strength, allowing the material to bend, move, & return to shape even under tension forces. Thermo-Tec Super Sonic Sound Dampening Mats are 70 mil in thickness, contain a high temperature adhesive backing, and is easy to trim & fit. The rubberized compound is applied with the high temperature adhesive to absorb all those out of control noises and vibrations. This Thermo-Tec Super Sonic Sound Dampening Mat measures 36" x 33 1/2 FEET and has an adhesive backing for easy installation.